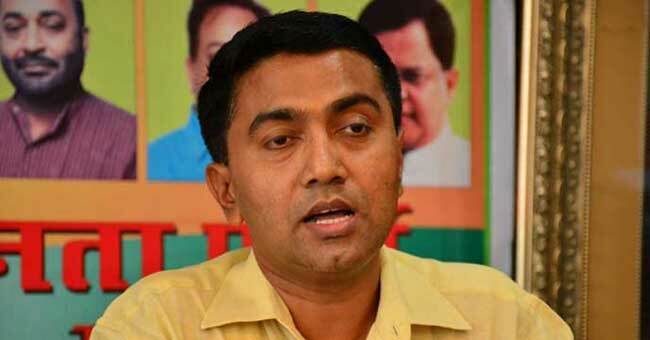 Panaji, Mar 19 (PTI) BJP's Pramod Sawant was Tuesday sworn in as the new chief minister of Goa, succeeding Manohar Parrikar, cremated hours earlier with state honours. At a much-delayed swearing-in ceremony, held around 2 am Tuesday, 11 other MLAs, part of the Parrikar-led cabinet, were also sworn in as ministers. The ceremony, held at a cramped Raj Bhavan, was to take place at 11 pm Monday but was delayed due to inexplicable reasons. Sawant, 46, was Speaker of Goa Legislative Assembly. As per the power-sharing arrangement reached with allies, an MLA each from MGP and GFP, two small parties backing BJP in the coastal state would be made deputy CMs. Sawant said his party BJP has given him a big responsibility. Talking to reporters, Sawant credited Parrikar, who died Sunday after battling pancreatic cancer, for brining him into politics. After a stalemate following a series of meetings with the allies, he BJP managed to break the deadlock, offering them their pound of flesh, by accepting the key demand for deputy CM's posts. There was no such arrangement (Dy CM post) in place when Parrikar was the CM. "We managed to convince the alliance partners and finalised the formula of two deputy chief ministers for the state," a senior BJP functionary said. There werew a series of meetings involving the Goa Forward Party and Maharashtrawadi Gomantak Party's three MLAs each, an equal number of Independents, and BJP legislators since late Sunday night to reach a consensus on Parrikar's successor. Union minister Nitin Gadkari had flown into the state early Monday to lead the discussions. BJP chief Shah, who was also in Goa, is learnt to have supervised the party's cobbling up the requisite numbers to stake claim to form government. All the state Congress MLAs met Governor Mridula Sinha on Monday and staked claim to form government in the coastal state. "We are saddened by the chief minister's demise, but before his final rites are performed, a new government has to be formed...The governor acknowledged that the Congress is the single largest party and she said she will get back to us," Kavlekar told reporters. Parrikar was cremated with state honours here Monday, with thousands bidding the affable politician a fond farewell. BJP president Amit Shah, some Union ministers and chief ministers of BJP-ruled states attended the funeral at Miramar. Parrikar's eldest son Utpal lit the funeral pyre. The funeral procession started from the Kala Academy where thousands, including Prime Minister Narendra Modi, paid their last respects to the former defence minister. The mortal remains of the 63-year-old senior BJP leader were kept in a flower-decked hearse which left for the Miramar beach, where the last rites were performed.